We Boomers never think about death. We are too busy celebrating the fact that collectively, we are the luckiest, wealthiest and longest living generation ever born. We are the luckiest generation because we were born between 1948 and 1964, when vigorous postwar era economic expansion gave us a world with a strong labor force, high job security, generous pension plans, and guaranteed social security. We are wealthiest because we found reliable jobs directly after high school or, we paid for our post secondary education at a fraction of today’s cost. We bought our first home cheaply only to see that initial investment debt mushroom into a surplus as property values increased. The Boomers are living longer because of modern medicine and the many advancements in medical therapy that offset the afflictions of old age. As a result, we have more retirement funds than any previous generation and the health to enjoy them. Along the way, we have taken more than our fair share from the system and the planet and left less for the generations that follow. The Boomers are a generation that ignores death simply because we are too busy enjoying our luck, wealth and health. The sad reality is that we too, will die. From the first breath, we share the same inexorable pathway to life’s end. For the Boomers, time is up. I am a Boomer, but I do think about death, perhaps more than the average individual. This is because I have seen death more often than most. In 3 decades as an MD, I have witnessed the ephemeral nature of life and the cumulative experiences have provoked sober thought and sometimes painful reflection. For me, caring for the dying has also prompted personal action. In my 30’s I composed a will, revised it when the children came, and will keep it up to date as the future unfolds. I am aware that the life expectancy of a woman in the Okanagan is 81 years, but I also know that between 50 and 70 many things go wrong, and some are terminal. (I am in that age group). My husband and I have had conversations about dying. We have given each other the permission to move on should the other die, to remarry, or at least not to end life alone. I do not want the man that I love to face a solitary journey should I leave him early. In spite of thinking I had dealt responsibly with the business of dying, I have recently discovered that there are parts of death that I had not considered. To my surprise, the epiphany occurred in a cemetery at a time when I have never felt more alive. 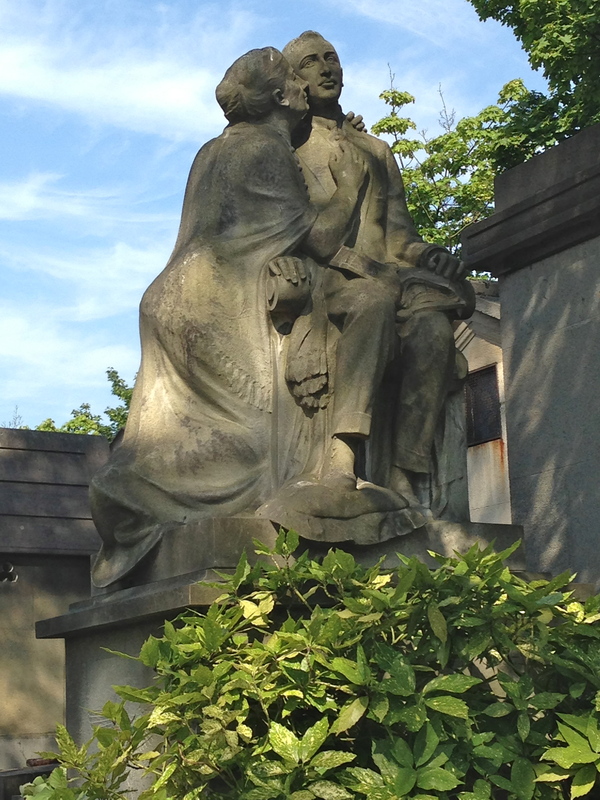 This summer in Paris I visited Pere Lachaise, a serene 140 acre cemetery in a city of 11 million. In 1804 when it opened, the cemetery was far from Paris, but as time went by, the city encroached upon Pere Lachaise, encasing it like a cocoon. Stone walls 30 feet high protect the silent inhabitants of this sublime place, buffering them from the cacophony of the surrounding city. Inside, ancient trees shade the cobbled roads that lead to the final resting sites of 1 million souls. 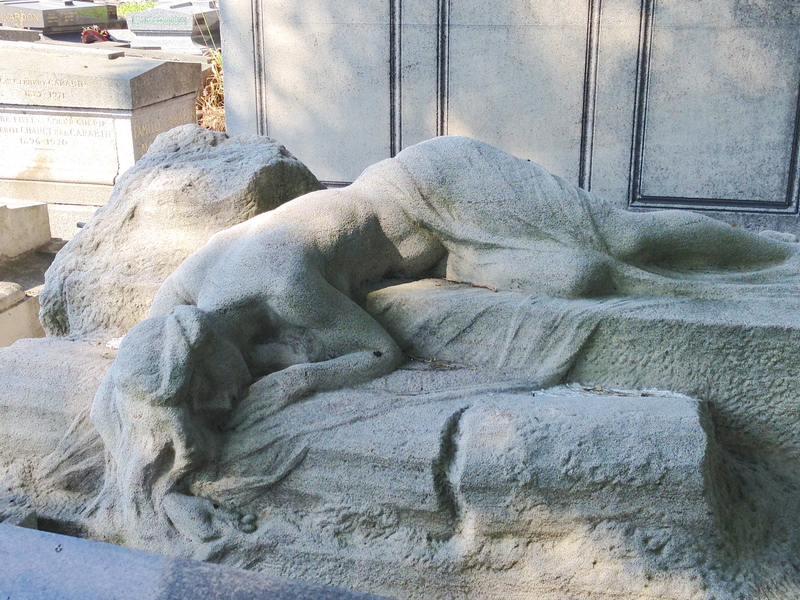 Pere Lachaise is the final resting place of many legends and heroes. I was there to visit, among others, Jimmy Morrison’s grave. Morrison is a touchstone for my youth long gone and I wanted a moment to recall a magic time before he tragically died in a Paris hotel. What I did not expect to find there were the young men who also came to pay their respects. I found them in the early hours, kneeling silently at Morrison’s headstone while they played Light My Fire on their iPhones. Forty years after his death, who could have imagined these young men? Born decades after Morrison’s passing, they needed to bear witness to a time in history that they did not share, but wished to remember. If Morrison was alone at the end of life, he was not in death. I walked the uneven cobbled pathways past the winged sepulcher of Oscar Wilde and took a minute to thank him for making me laugh. With such a bitter end to his life I wondered what witty quip he would bestow upon the countless people who came to kiss his grave. (The lipstick of those kisses has eroded the stone and forced Paris to enclose his headstone in plastic). Edith Piaf was alone, and I could imagine the strains of her beautiful music inside my head. I thought about our own Judy Rose whose voice brings Piaf back to life. Chopin was not far away and I marveled at his genius and industry. The rich legacy that is the body of his work was accomplished in the 40 odd summers Chopin spent on this planet. Interspersed among the famous people buried in Pere Lachaise, are many ordinary folk – the spouses, children and parents of ordinary Parisians. I watched family members quietly tend the graves of their loved ones, watering the flowers and sweeping the headstones. It was these small acts by ordinary citizens that led to my epiphany. I have never been in favor of burial after death, but in Pere Lachaise I could see and feel the benefits of a cemetery. A gravesite is not a place for the dead, but for the living. It is a physical place to reconnect with a loved one, now gone. As I walked Pere Lachaise in the peace and quiet, I wished that I could visit my own mother in the same way I had visited so many others that day, others I did not know. I recalled being 21 and for the first time, being taken to my father’s grave. No one in my family had taken me before; so raw was their own sense of loss for this man, my father dead at 26, a man I can barely recall. I witnessed their grief, but for me, the visit brought a certain peace and closure. The physical presence of my father’s grave reconnected me with the 2 precious memories, long forgotten, that I have of this man in my first 2 years of life. Although I have not visited my father for many years, I did replace the weathered headstone last year, finding that the act provided me some small comfort. That day in Paris I thought about my parents, and I thought about my husband and myself. I realized that, during all of our discussions, it had never occurred to me that I might outlive my husband. I had assumed that I would be the first to die. And then the questions came. What if my husband died and I remained? How would I touch him? Where would we talk if he were cremated? If I needed his advice, how would I reach him if he were scattered on the wind? On a cobbled path in Pere Lachaise I realized with clarity and intensity, a personal desire previously unknown. Should I outlive my husband, I would want to bury him in such a place as this, a solid place, one that I could visit, one that would be a touchstone for the memories of a life shared, a place to anchor my experiences with him in a present and future I faced alone. This entry was posted in Uncategorized and tagged Boomers time is up, cemetery, cremation vs burial, facing death, Jimmy Morrison, Pere Lachaise cemetery by April Sanders. Bookmark the permalink.